Freedom Rockz: Super Bowl Party Ideas Great Quick Recipes Yum! Super Bowl Party Ideas Great Quick Recipes Yum! Puts an elegant spin on this all-time favorite appetizer. 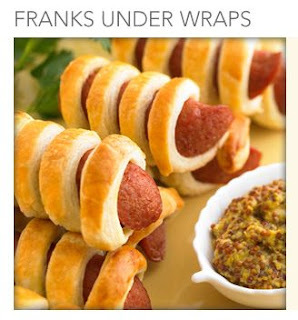 What could be easier--wrap strips of puff pastry around frankfurter halves and bake.More great recipes at © 2012 Pepperidge Farm. Click the link below to get more great recipe ideas for game day!